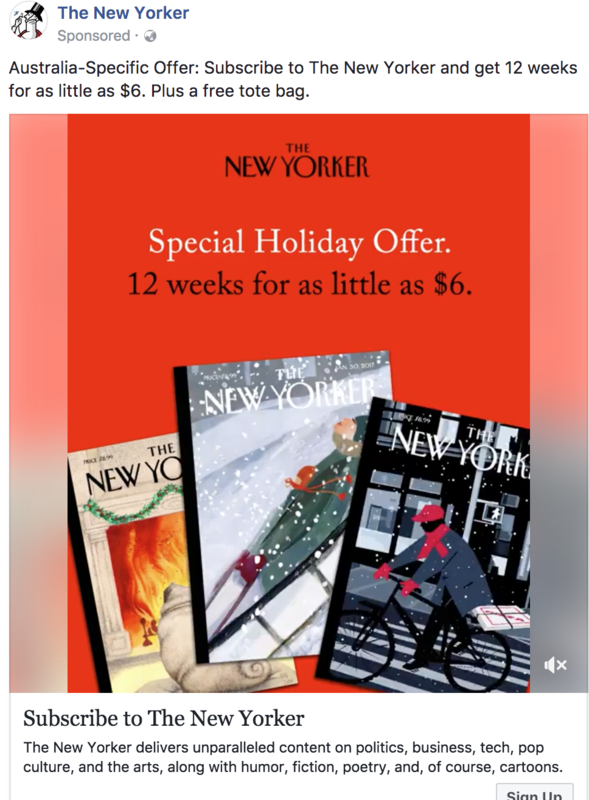 The New Yorker is running a sizeable campaign on Facebook inn Australia pitching twelve weeks of the weekly magazine for $6.00. This is a stunning offer not only because of the price but because of the direct to consumer offer from a US publishing company. While the title has narrow appeal, at that price the appeal would be broader than usual for it. If you click sign up you see the offers available. 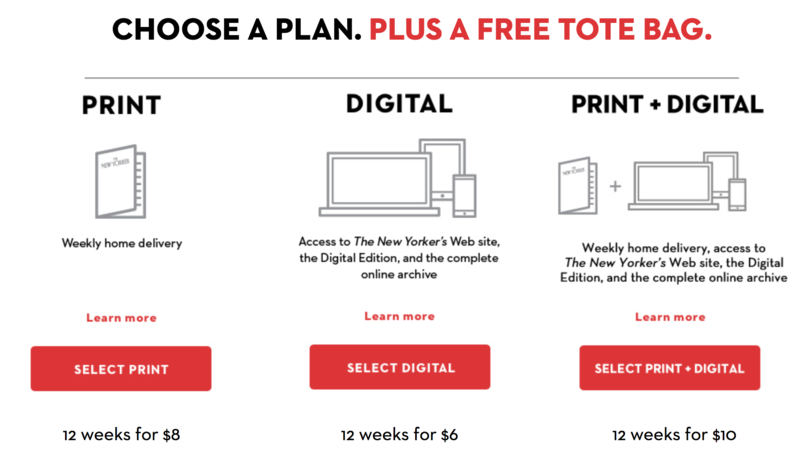 The headline offer is for digital only. However, twelve weeks home delivered for $8.00 is still a sweet offer. There is no countering this. I anticipate we will see more publishers of overseas niche titles making similar pitches, especially for digital editions. Yes, a sweet offer indeed, until you find your account debited with a full year subscription without warning. Of course it can be cancelled at any time but finding the “Customer Care” contact number in Australia to do so is proving time consuming and so far unsuccessful. Any help would be appreciated. I signed up for a 3 month trial but wish to cease the offer after 3 months. Alarm bells are going off …….. This newpaper deal appears to be a permanent investment in the newspaper. Once you sign up, you cannot cancel subscriptions. I thought this newspaper, which I have purchased outside Australia, would be an honest institution. BEWARE EVERYONE. It is not. Are you sure you subscribed for the New Yorker via the actual New Yorker site? I signed up and had a wonderful time reading something decent. Subscriptions made it very clear that there would be an automatic renewal (for a full year subscription) at the end of the 3 months unless you cancel beforehand. I made a note of this and simply went online to cancel the subscription before the time. I also received emails to warn me that the automatic renewal time was approaching. It could not have been easier or more straight forward. As for countering overseas publishers, who the would want to? Australian newspapers and mainstream journalism is appalling.